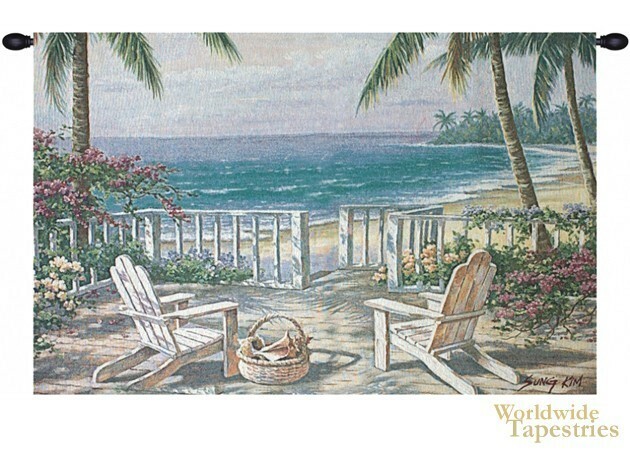 This Coastal View tapestry shows a seaside scene of the beach and palm trees. In this piece we see a deck and deckchairs looking out onto the vista of tropical island and ocean. A basket of cockles and sea shells can also be seen nearby. This Coastal View landscape tapestry is backed with a lining and a tunnel for easy hanging. Note: tapestry rods and tassels, where pictured, are not included in the price.